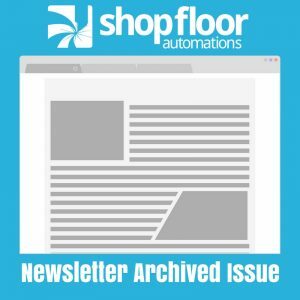 The following is an archived copy of the Shop Floor Automations Newsletter – May 2011. The manufacturing industry continues to grow and the upswing in business seems to be around the corner for our customers. Although most of us have not fully recovered from the recession, there is hope through automation and solutions. Shop Floor Automations is here to bring your attention to some of the new products we have found to be most productive and keep the machines running! Many of our customers have been using Predator DNC or other competitive products to communicate to CNC machines for years. These systems are very reliable and typically are untouched until something goes wrong. Do you have a plan in place? Check out our backup USB solution to add to your CNCs or have on the shelf for when that day comes. Works with any brand or size USB memory stick and any CNC control. Capturing real-time data from the shop floor does not have to be complicated. Using your existing infrastructure and computers, our data collection can be added to your equipment with ease. Works with any type of CNC control including Mazak, Fanuc, Haas, Okuma, Siemens, Cincinnati and robots, press brakes, bar feeds, welders, and more. Report, chart and display the machines current status, including cycle, idle, and down times on any PC or shop floor LCD. Later you can expanded to, capture job numbers, part numbers, downtime reason codes, scrap reason and more with our Enterprise MDC. Scheduling is the key to efficient operations. With Jobpack Production Scheduling software, you can quickly identify bottlenecks and react in real-time to unexpected production problems. You’ll know what job to run next, when to promise the customer’s order, and what machines can get it done the fastest. You can optimize production capabilities while achieving realistic delivery dates to keep customer satisfaction humming right along.